Public holidays like Christmas and New Year just get in the way when you’re on the road. Everything shuts down at inconvenient times and you run the risk of finding yourself stuck in a ghost town with nothing open and no supplies, or overrun by holidaymakers. Bah humbug. We decided to find somewhere to settle in and wait it out. We picked a beach in Uruguay. The forward thinking Uruguayans separated their public holidays from religion in 1919. So, christmas day is officially ‘day of the family’ and easter is ‘tourism week’. An interesting progression from the older pagan holidays through a christian overlay to capitalist materialism. Uruguay is pretty cool. 94% of electricity is obtained from renewables, essential services are nationalised and subsidised, education is free to all from preschool to (and including) university, there are quality public health services, and free wifi in most places – even on the buses. Most personal freedoms – like gay marriage, abortion and marijuana – are legal. It really seems to be an equitable, free and tolerant society where the people are relaxed, easy-going, respectful, friendly, intelligent and creative. What’s not to like? We are having a proper summer holiday in a little cabin by the sea. Things feel very different outside of Montevideo. 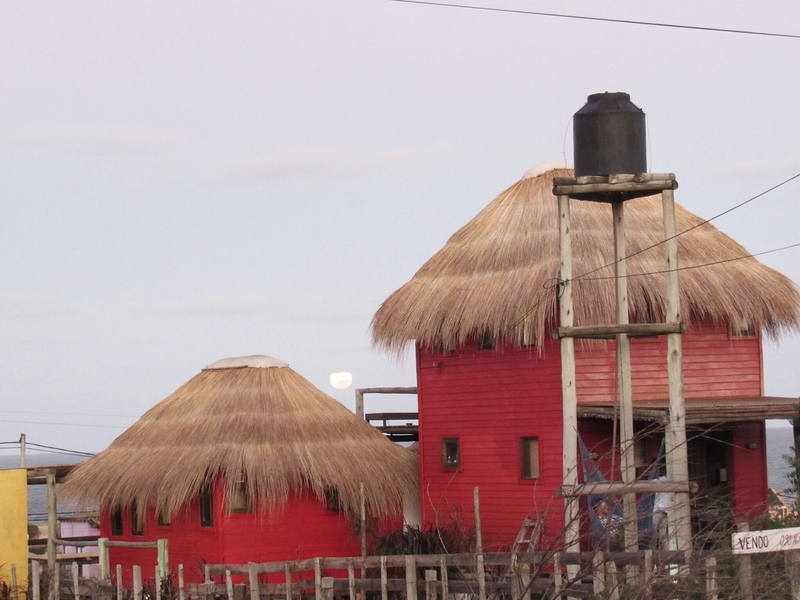 Uruguay has a long sea frontage to the Atlantic Ocean. 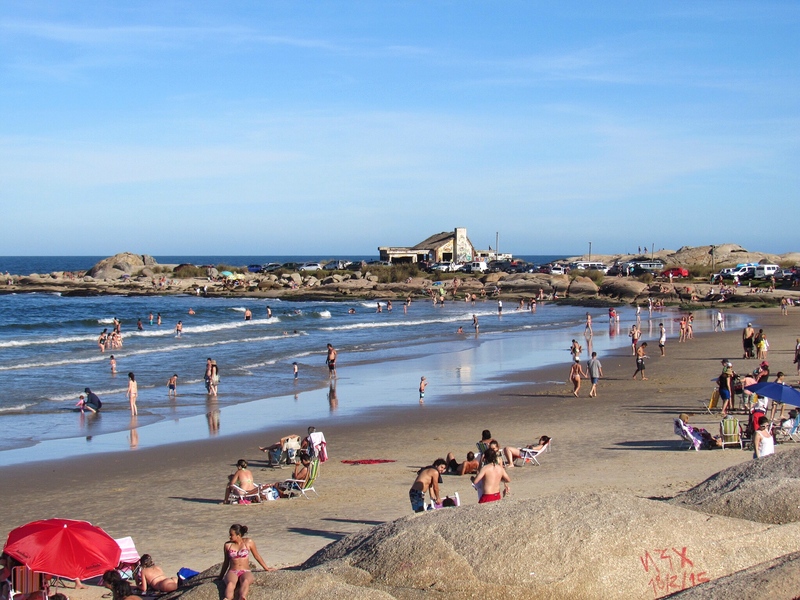 There are posh beaches closer to Montevideo where the glitterati from Argentina and Brazil go to play, but as you move out along the coast the seaside villages become smaller, further apart and with less services. Some are very rustic with no running water, electricity or wifi. We chose the furthest one out that had all three of these things. 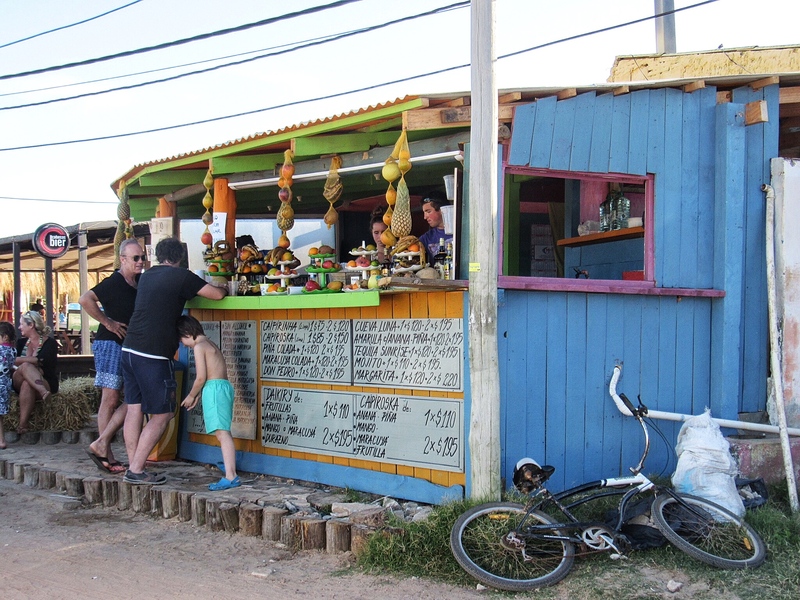 Described somewhere I read as ‘where hippie meets hip’, Punta del Diablo (Point of the Devil) sounded just right for us. So many things here are similar to being on a summer holiday in Australia. The pretty white sandy beaches and the people look the same, the same summer fruit is in season (peaches, plums, cherries, pineapples, bananas), the vegetation is very similar (gum trees, palms) and the weather is perfect beach weather – hot and sunny with blue skies. There’s a definite holiday atmosphere. There are no high rises out here, nothing over two stories. There are no bitumin roads, big hotels or shopping centres and no big fences or mean dogs. Everything is small and simple. All the beaches are open to everyone and you can walk for 100km in each direction. 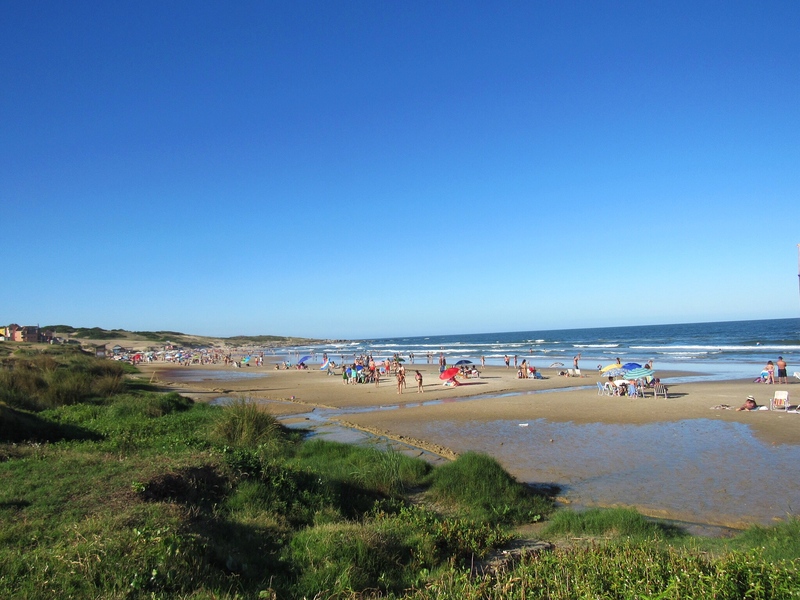 The usual population of Punta del Diablo is less than a thousand, except for December/January when it swells to up to thirty thousand tourists. Unbelievably, the infrastructure still seems to work – water, wifi, transport, electricity. There is one ATM in town that works most of the time. There are little craft stalls and seasonal bars and cafes just back from the beach. There are a few backpacker hostels. They all have character and look like so much fun. Non-stop party time all night and day! For the over thirties and the anti-social there are the cutest little cabins to rent out – in every possible style and colour of the rainbow. Without all the unnecessary rules, regulations and fees that we have in many countries like Australia, anyone can build a cabin or set up a stall or business. This allows room for innovation, creativity and variety. It becomes self-regulating by the tourism industry. If the cabin isn’t perfectly comfortable and everything doesn’t work smoothly they get bad reviews and no customers. Simple. Ours is perfect. Good pressure hot water shower, gas stove and oven, fridge, free wifi, air-con, balcony, comfortable bed with a view of the ocean. What more do you need for a summer holiday? 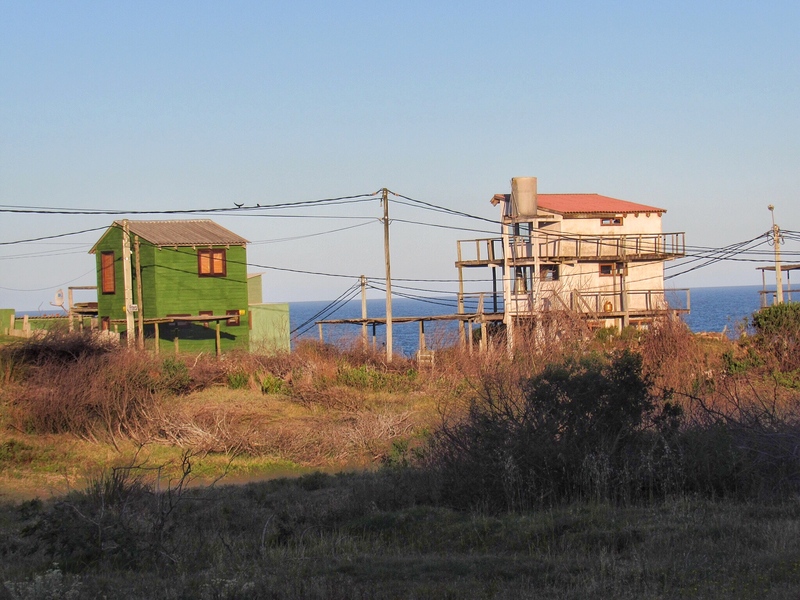 In Punta del Diablo there are no obvious police – the only one we saw was a single car drive past on New Year’s Eve, even though there were at least 20,000 tourists partying in the street. There are no security guards, rules, signs saying ‘no’ or ‘don’t’, no trouble, and no fighting (not even amongst the dogs). It’s a perfect place for a summer holiday and to celebrate the beginning of a new year. Sitting in groovy friendly little bars and looking out to sea in the moonlight, with great music, cheap delicious cocktails, a few fireworks and happy people all round. 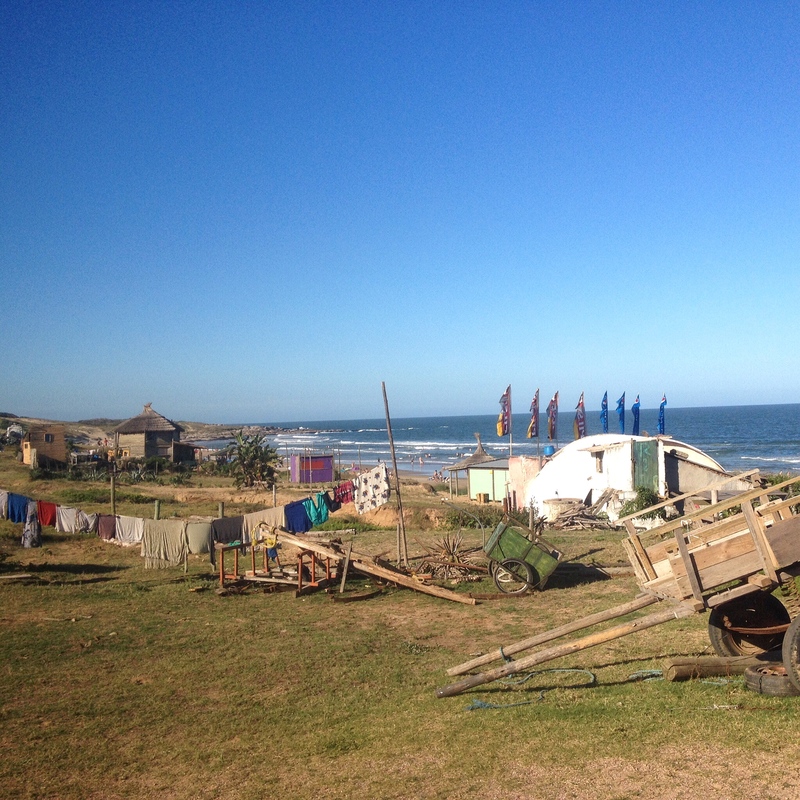 This entry was posted in Uruguay stories and tagged beach, punta del diablo, south america, Travel, Uruguay. Bookmark the permalink. Glad you are having a nice time. This sounds like a great place Jeanne!